Release 1.20 is coming soon to all Stickyworld portals. This is a major upgrade with some big performance boosts. In this post I'll describe some of the major benefits and features we've included in this new release. I hope you find them informative, and please tweet questions @Stickyworld or comment below. 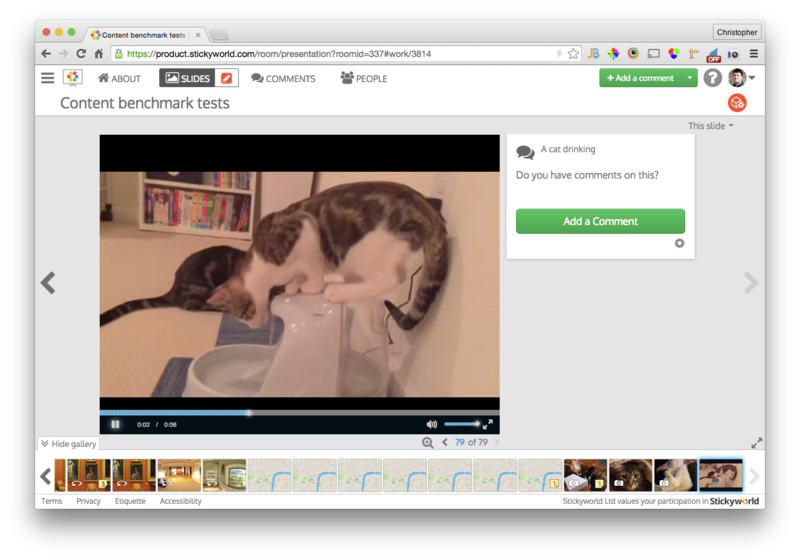 To compensate for the fact this post covers technical benefits, we've included screenshots of the cat videos :). My dev team uses these when testing and we're sure you'll love them. Read on to get the details on the release. The biggest change in this release is centered on how media files are stored and served. We have focused on speed on file delivery and efficiency. Read on below to find out more about the specific improvements. As part of this update all media content for slides, comment context view images and comment attached images are being re-processed. Several output sizes are being created so that rooms can serve the appropriate sized content based on the device screen size. As a result, mobile users and smaller desktop screens will be sent smaller files appropriate for their screen size. This is a huge benefit, especially if you are using mobile data to load rooms, you want to load the least amount of data possible and this should help in that area. Additionally all output images are being optimised for web delivery, correct image compression levels and other techniques to ensure the files are as small as possible. Another major benefit is that all processed media files are now being stored on Amazon S3 and additionally served using the CloudFront content delivery network. This ensures that your media is served to you as fast as possible, with low latency and high data transfer speeds. Using the CloudFront CDN also offers a huge benefit for non-UK customers, as files will be served to them using the closest server available from their global edge network. With locations throughout the world this will drastically improve performance of rooms for customers in the US, Europe, Asia, South America and Australia. We have developed several external content processing services in order to ensure intensive tasks like processing media do not impact the browsing experience. As part of this, media processing is now done in the background, this means that you no longer need to wait for a slide conversion to finish. Instead, after your file has uploaded, you will see that the slide is being processed, leaving you free to continue to add other slides, go about any other room activity or simply close the browser. The slide conversion happens in the background and when your media is ready it will appear. Similarly for comments, saving should be quicker than before, the point of view image will be processed in the background and will display when processing has completed. As a consequence of the asynchronous media processing any relevant email alerts including these images will not be sent until the point of view image is ready. 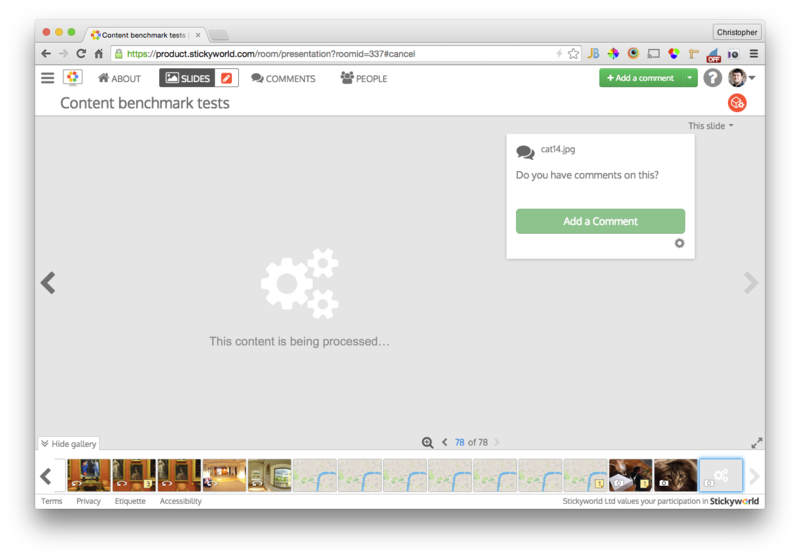 You can now upload your own videos without having to go through YouTube. Your video once uploaded will be processed into several HTML5 video compatible formats and sizes, ensuring a mobile device receives a smaller video file to play compared to a large desktop. Videos support comments similar to YouTube videos, however native video comments will have the added benefit of including point of view images for the current video frame. This is something that was not possible to achieve with YouTube videos. Videos can take quite a long time to process, especially for longer videos, so please be patient! If your videos still haven't shown after a couple of hours you can contact support using the Contact Support link in the Help dropdown in rooms. Document based uploads (PDF, MS Word, MS Powerpoint) files are now using a different document viewing service called Box. As a result you will see a small Box logo in the bottom left of the document viewer. This Box document viewing service offers much better support for scalable vector graphics and custom fonts, which should mean better support for detailed architectural and design PDFs. We have removed Excel as an upload option as this is not supported by Box and the demand for this type of file upload has been low. 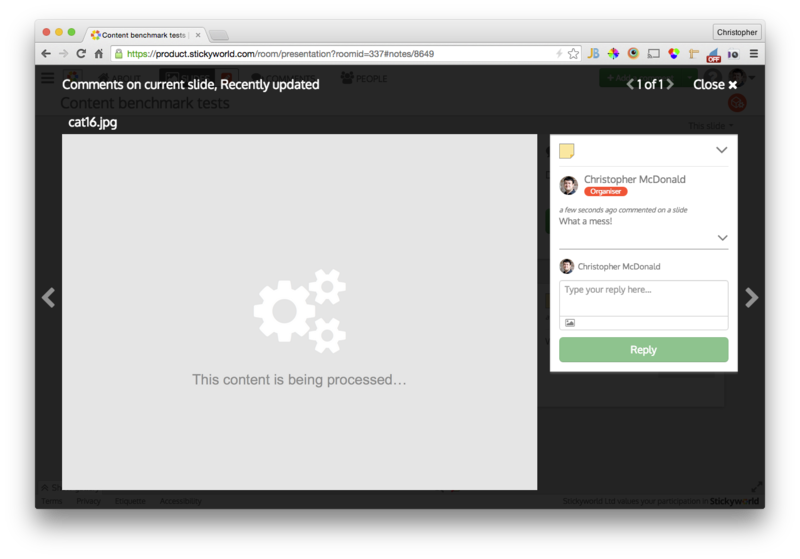 Existing Excel slides following the content migration will show as having failed conversion. This major update includes infrastructure changes to Stickyworld which should have big performance improvements for everyone viewing your rooms. Your rooms should load faster, displaying the right sized images for your device. Global access to Stickyworld rooms is a step closer with this update and with the addition of native video uploads, you can now record and upload a welcome video from your device or computer and upload it direct to Stickyworld in minutes. We are committed to improving the performance of Stickyworld on the web, so your visitors will get to see your content as quick as possible and have the best chance to participate. If you're an existing or new customer and would like a one on one webinar demo or call on how the new performance features benefit you, just sign up below and we'll be in touch.